Interactive artworks are like video games played in an art gallery. Video games are concerned with building “interactive fictions"1 and interactive artworks “have an open ended framework that allows or even encourages the audience to ‘complete’ their creation”2. 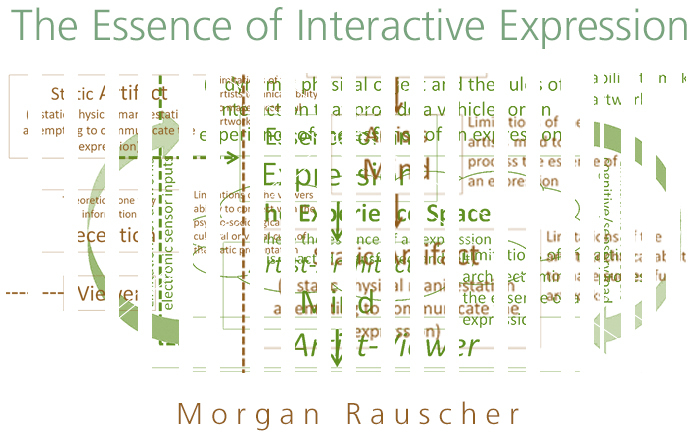 The essential technological components that make up interactive technology are universal. Interactive art facilitates non-linear narrative generation via human computer interaction, thereby, creating co-generated environments that facilitate a variety of possible experiences, narratives and events. The advent of dynamic bi-directional interactions afforded by computational processes, in newly emerging interactive art, presents many exciting possibilities for creative venue. However, just as with classically produced mono-directional expressions, there are functional and structural limitations that must be accounted for when building interactive artworks. Effective transference of the ‘essence of an expression’, depends on meaning-making mechanisms that can be impeded by the limitations of creative electronics systems. These mechanisms must be accounted for in order to ensure that agency is given to a user to excogitate the meanings of an interactive artwork. The user, participant, observer, or what I will call the ‘artists-viewer’ is in control of decoding the essence of an expression from a series of dynamic interactions that are designed by what I call an ‘artist-architect’. In addition, the aesthetics of a given interactive artwork and the necessary interactive elements required to evoke the essence of an expression must be considered. 1 G. Tavinor, The Art of Videogames. John Wiley & Sons, 2009. 2 A. Marcus, Design, User Experience, and Usability. Theory, Methods, Tools and Practice: First International Conference, DUXU 2011, Held as Part of HCI International 2011, Orlando, FL, USA, July 9-14, 2011, Proceedings. Springer, 2011.